The QTextBlock class provides a container for text fragments in a QTextDocument. A text block encapsulates a block or paragraph of text in a QTextDocument. QTextBlock provides read-only access to the block/paragraph structure of QTextDocuments. It is mainly of use if you want to implement your own layouts for the visual representation of a QTextDocument, or if you want to iterate over a document and write out the contents in your own custom format. Text blocks are created by their parent documents. If you need to create a new text block, or modify the contents of a document while examining its contents, use the cursor-based interface provided by QTextCursor instead. Each text block is located at a specific position() in a document(). The contents of the block can be obtained by using the text() function. The length() function determines the block's size within the document (including formatting characters). 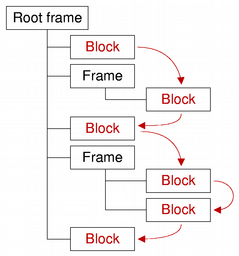 The visual properties of the block are determined by its text layout(), its charFormat(), and its blockFormat(). The next() and previous() functions enable iteration over consecutive valid blocks in a document under the condition that the document is not modified by other means during the iteration process. Note that, although blocks are returned in sequence, adjacent blocks may come from different places in the document structure. The validity of a block can be determined by calling isValid(). QTextBlock provides comparison operators to make it easier to work with blocks: operator==() compares two block for equality, operator!=() compares two blocks for inequality, and operator<() determines whether a block precedes another in the same document. See also QTextBlockFormat, QTextCharFormat, and QTextFragment. Copies the other text block's attributes to this text block. Returns a text block iterator pointing to the beginning of the text block. Returns the QTextBlockFormat that describes block-specific properties. Returns an index into the document's internal list of block formats for the text block's format. Returns the QTextCharFormat that describes the block's character format. The block's character format is used when inserting text into an empty block. Returns an index into the document's internal list of character formats for the text block's character format. Returns true if the given position is located within the text block; otherwise returns false. Returns the text document this text block belongs to, or 0 if the text block does not belong to any document. Returns a text block iterator pointing to the end of the text block. See also begin(), next(), and previous(). Returns true if this text block is valid; otherwise returns false. Returns the QTextLayout that is used to lay out and display the block's contents. Note that the returned QTextLayout object can only be modified from the documentChanged implementation of a QAbstractTextDocumentLayout subclass. Any changes applied from the outside cause undefined behavior. Returns the length of the block in characters. See also text(), charFormat(), and blockFormat(). Returns the text block in the document after this block, or an empty text block if this is the last one. Note that the next block may be in a different frame or table to this block. See also previous(), begin(), and end(). Returns the index of the block's first character within the document. Returns the text block in the document before this block, or an empty text block if this is the first one. See also next(), begin(), and end(). Attaches the given data object to the text block. QTextBlockUserData can be used to store custom settings. The ownership is passed to the underlying text document, i.e. the provided QTextBlockUserData object will be deleted if the corresponding text block gets deleted. The user data object is not stored in the undo history, so it will not be available after undoing the deletion of a text block. For example, if you write a programming editor in an IDE, you may want to let your user set breakpoints visually in your code for an integrated debugger. In a programming editor a line of text usually corresponds to one QTextBlock. The QTextBlockUserData interface allows the developer to store data for each QTextBlock, like for example in which lines of the source code the user has a breakpoint set. Of course this could also be stored externally, but by storing it inside the QTextDocument, it will for example be automatically deleted when the user deletes the associated line. It's really just a way to store custom information in the QTextDocument without using custom properties in QTextFormat which would affect the undo/redo stack. Stores the specified state integer value in the text block. This may be useful for example in a syntax highlighter to store a text parsing state. Returns the block's contents as plain text. See also length(), charFormat(), and blockFormat(). If the block represents a list item, returns the list that the item belongs to; otherwise returns 0. Returns a pointer to a QTextBlockUserData object if previously set with setUserData() or a null pointer. Returns the integer value previously set with setUserState() or -1. Returns true if this text block is different from the other text block. Returns true if this text block occurs before the other text block in the document. Assigns the other text block to this text block. Returns true if this text block is the same as the other text block.